The system is made of maintenance free polyethylene pipes which are attached directly to the beams/purlings with plastic ties and the sprinklers are lowered below the lights. The sprinklers are a special design that requires a very low volume of water/ pressure and give a rain-like effect over the riding surface. 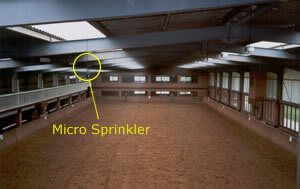 A 20m x 40m school requires approximately 35 sprinklers that will spray approximately 60 liters of water per minute (15 gallons per min). Weather conditions and the type of surface will determine the exact amount of water required. The system is divided into several spray lines which may be operated in isolation or simultaneously, according to the pressure available. The system requires no maintenance and is easily operated from one control area. Parts included in the system are filters, pipes, sprinklers, drain valves, control valves and ties. It usually takes one day to fit and install the system. works directly off the mains and does not require a pump or tank. may be used as often as required. is straightforward to erect (can be supplied as a DIY kit). has specially designed sprinklers giving a micro spray of droplets for an even dampening of the ground without creating puddles or bogs. can be provided with manual control or with an electronic automatic timer. is bespoke and designed according to your requirements.